June 5, 2014 - GritTec has made accessible technology of GritTec's Dual microphone array solution (Version 2.10) under Linux platforms. 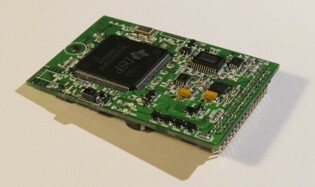 January 23, 2014 - GritTec has presented miniature module of noise cancellation of speech signals "M-NC" for embedded systems. November 16, 2012 - GritTec has updated GritTec's Speaker-ID: The Mobile Client (Version 2,50) software. November 01, 2012 - GritTec has presented a release of new version of GritTec's Speaker-ID (Version 3,55) engine. "M-NC" device is intended for reducing the external hindrances and background noises in speech signals in real time mode. Noise cancellation technology of "M-NC" device is based on using of adaptive filtering and spectral subtraction by GritTec's Noise Cancellation (Version 2.20) engine. To learn more details, contact us via Online Request form.